February Challenge Colossians 3:23 --Whatever you do, work at it with all your heart, as working for the Lord, not for human masters. I think we all work hard at many things in life--so I want to challenge you to think of what you might work hard at, but cheerfully. You can take this a few ways: ~Perhaps--you can take a picture of what you would do as a career, if you could "be anything you want to be" when "you grow up". The sky is the limit--no restrictions at all. What is a job you would love to have? ~Or--look around and see what you love to do in life. It could be cooking, or crafting, or gardening, or reading, or whatever....... What do you do that always puts a smile on your face or gets you in a good mood? Honestly, I have struggled with this. I mean gee, here it is - almost 4pm and I'm just now writing this post. I had ideas...but nothing seemed to really settle in my soul. Certainly I work full time and try to do my job to the best of my ability and also as a reflection of God. And yes, I do other things in my life outside of work such as my crafting where I try to also show the love of Jesus. But nothing was really clicking when thinking about what to write today. And as far as trying to put that into a "photo" - well, my mind was a total blank. Then I got to thinking about life in general....you know - daily living. The verse started speaking to me with a loud horn then!! "WHATEVER you do, work at it with all your heart...." It doesn't say just one thing - just do your job that you get paid for....or your crafting....or what you like to do....it's even the stuff you don't like to do....it's even doing the dishes...it's dusting....it's laundry...and yes - even cleaning the bathroom. And Barb including the Living Bible translation was wonderful - "Work hard and CHEERFULLY at ALL you do.....". Can I say that? I can say that I do everything cheerfully? Can I say that WHATEVER I do, I do it with all my heart? I realized that part of why I was struggling so much with this theme is because God was speaking to my heart and showing me that I do need to make some adjustments. Most people would look at my life and say yes, I do. But in the deep recesses of my heart, there is some grumbling and resentment sometimes - and that is what God sees. That's the ugly parts that I can slap a smile on my face and hide from everyone else...but God sees and God knows. And is that truly being a reflection of Jesus? The Bible says in II Timothy 3:16 that "All scripture is given by inspiration of God, and is profitable for doctrine, for reproof, for correction, for instruction in righteousness". This certainly was given to me for reproof, correction, and instruction. I don't have a photo to share with you today....but I do have something that I found on Pinterest. 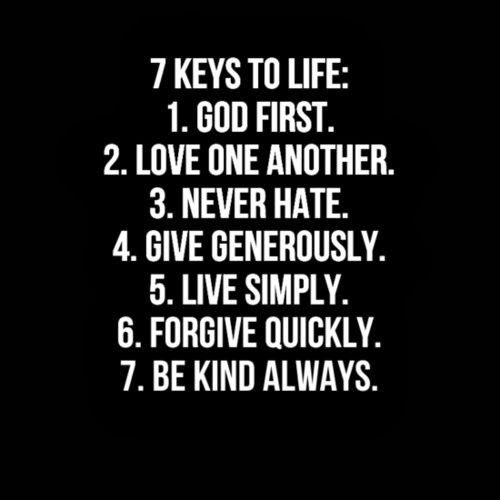 There is a lot of truth in these 7 keys to life.....and the first one is the most important! The really neat thing is if you master the first one - the other 6 you don't even have to work at because they just automatically happen. I hope you take the time visit the other Carriers of Faith. You can find the blog role on the left hand side of my blog. God bless you today and thank you for stopping by to spend a few moments with me. Wonderful post from Pintrest- says it all! Loving your post! What a beautiful post Zella. You are so right and I loved reading about how all of this was confirmed! Thanks for posting for my month with the Carriers of Faith! Zella, you are right on track! Just know that I will be thinking of your post the next time I am not exactly happy to be doing what I will be doing. Thanks! Wise words, Zella - beautiful inspirational post from Pinterest! You're a wonderful job of juggling many things and doing it all with a smile and positive outlook! Zella, your post was worded/written so well and spoke of your heart. Nicely done! And the "photo" is certainly great words to live by. A great reminder! Thanks for sharing your insight and there is so much truth in what you said about if you follow the first one, the rest fall into place!